Once you visit Bali or Lombok, you can continue your journey to Thailand. You can visit Bangkok. The city is located on the banks of the Chao Phraya River, Bangkok (or so-called ‘Krung Thep’ by locals, is a paradox that thrilling. Thailand's capital is to maintain old legacy opens at the same time welcoming new things with full enthusiasm. After becoming the capital for more than two centuries, Bangkok in the last 20 years has seen many changes. Skyscrapers form a new city, the SkyTrain divides the city with fast trains, and subways are also ready to take people on the move. 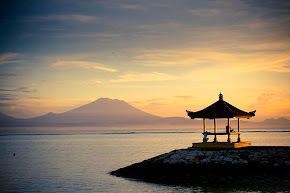 Bali is a great place to enjoy a fantastic night life. Trust me, you will not lonely in Bali. After one day tour to see many tourist destination around Bali, you should prepare for an extra adventure; a night life in paradise. Wow…. Night life in Bali starts late, which means around midnight. Many visitors wonder where crowds of expats suddenly come from around 1:00 in the morning – even when all of Kuta has been very quiet during the whole evening, the IN-places often become crowded after midnight. Let’s enjoy the music, dance, and surrounded by International people. There's a simple explanation: during the early evenings many of Bali's night owls either still work, visit friends at home, or simply sleep. Most of them visit pubs, café, bars, or discos only in the early morning hours. Therefore, if you plan a night out don't start your dinner too early. Between 9:00 p.m. and midnight there are not many places we can recommend. For further information you can ask your tour guide or the hotel receptionist. They will give you a lot of information. Visitors looking for company don't need to worry. Wherever you go in Legian, Sanur, Nusa Dua, Ubud and the Kuta area, there are many other single travelers with the same problem around – day and night. You can find your future fiancé in Bali. Who knows?